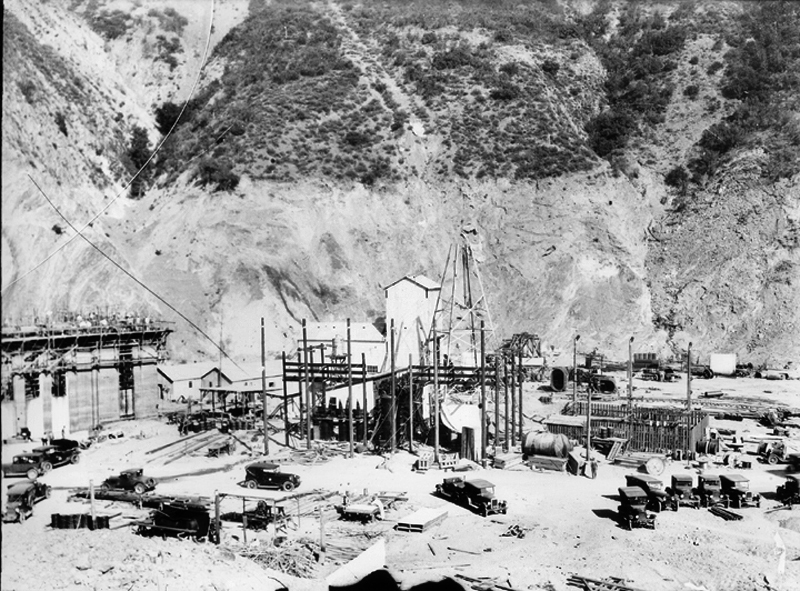 Here is a photograph of the rebuilding of DWP's Power Plant #2 following the failure of the St. Francis Dam in 1928. I found the original 4x5 glass negative in a box of old photos which I had been directed to throw away during the cleanup of a office in the DWP's Electrical Repair Shop when I was an Electrical Craft Helper in 1968. I rescued about 8 glass negatives and had contact prints made which I later scanned into my computer. The original negatives were given to the DWP's Photographic Section when I retired from the DWP in 1998. The power house is on the left side of the photo and the temporary facilities can be seen in the rest of the photo. There is no date or information on the photo, but you can clearly see the hillside in the background of the photo has been striped of all vegetation by the water which came over the top of the hill upstream of the powerhouse. DJ2801: 9600 dpi jpeg from 96 dpi jpeg.